On Tuesday, June 8th, Mark S. Cartier will present a program at the Bridgewater Public Library on "The Beatlemania Years: 1962-1966." The program begins at 6:30 PM. The 75 minute program is designed for anyone interested in the music of The Beatles, from those newly introduced to the group via the new Rock Band game to the most avid fan. The presentation will cover the first half of the Fab Four's career from their first recording of Love Me Do in 1962 to the release of their seminal album Revolver in 1966. With the aid of several of their most important musical selections, the program will put the group in the context of the early 1960's touching upon the first wave of Beatlemania in England, the conquest of America, their first forays into film, their growth as singer-songwriters and their ultimate disillusionment with touring. Cartier recalls watching The Beatles on the Ed Sullivan Show as a nine-year old and has been a lifelong fan from that moment on. He owns the entire Beatles catalog in every available format. He has a wealth of Beatles facts, figures and trivia culled from the hundreds of books, magazines, interviews and documentaries devoted to their work. He has been a professional actor for over 30 years and is a dynamic speaker. This free program is supported in part from a grant from the Bridgewater Cultural Council, a local agency which is supported by the Massachusetts Cultural Council, a state agency. It will be held in the Flora T. Little Meeting Room on the lower level of the library. Around the Common would like to welcome our newest business listing The Reiki Shoppe! The Reiki Shoppe is located directly on the Common at 50 Central Square on the 2nd Floor. Having been in business in Bridgewater since 2006, The Reiki Shoppe is a unique business that specializes in a personalized service you cannot find anywhere else around. The minute you step into the shoppe, you will know what that means: a sense of peace and calming and the immediate connection you will feel with the owner of the Shoppe. The Reiki Shoppe is owned and operated by Lauren Deknis Bortolami, a native of Bridgewater, MA and a Catholic. Ms. Bortolami works with one client at a time for personalized one-on-one service and holds small Reiki classes with the maximum of 4 guests in her quaint and quiet shoppe at the Bridgewater Common. Ms. Bortolami works part-time in the Cambridge, MA area, is a full-time mom, and runs her shoppe part-time to help the general public as well as safety and military personnel with Reiki, a Japanese hands-on healing relaxation therapy. Ms. Bortolami is a certified Reiki Master/Teacher, Spiritual Worker, Herbalist and Ear Coning Practitioner. Other practitioners who specialize in Naturopathic Medicine and Spiritual Work are available by appointment at The Reiki Shoppe. Ms. Bortolami offers traveling and private in-house sessions and other evens such as the Traveling Wellness Space, Reiki Classes, Ear Coning/Candling and Raindrop Therapy. Ms. Bortolami's "Healing for Hope" Group is a team of Reiki Practitioners (including an RN) who volunteer their time for individuals who have cancer as well as firefighters, police officers and military personnel injured in the line of duty. Police officers, fire fighters and current members or veterans of the Armed Forces should contact The Reiki Shoppe for more information about programs and discounted rates. Mark your calendar for the 3rd Annual Pizza Fest to benefit the Bridgewater Public Library. Admission is $7.00 for adults and children between 3 and 10 are $3.00. Children under the age of 3 are free. Come taste samples of pizza from local restaurants and vote on the samples as to who makes the best pizza in a variety of different categories. All proceed will benefit the Friends of the Bridgewater Public Library and will be used to purchase new books, CDs, DVDs, books on tape, library supplies and other materials. For more information, please contact Rebecca McGrath at 508.697.5193 or via email at rebeccamcgrath@morseins.com. My family and I are reaching out for support and prayers for a cause very close to our hearts. Our good friends Bridgette and Tony DeBoe have nine-year-old twin daughters who suffer from Thalassemia, a rare blood disorder affecting the body's ability to produce hemoglobin. As of now there is no cure for this dreaded disease. Since the age of three the twins have received and continue to receive monthly blood transfusions to combat the effects of Thalassemia. Six years ago, we thought a great way to help out this wonderful family would be to ask family, friends, and members of the Bridgewater and outlying communities to sponsor me in my first running of the Falmouth Road Race. This is how "Running for the Twins" was started. From running on my own the first year, to a team of 11 runners last year, the support that we have received over the past five years has been overwhelming. The team will be running the race on August 15, 2010. We cannot thank the organizers of the Falmouth Road Race enough for their support over the years to our cause. Every year we all receive many requests for donations to worthwhile causes. Since we cannot contribute to everything, choosing can be difficult especially during these extremely tough economic times. We have decided to reach out to the Facebook community to help us continue to raise funds to assist the DeBoes in their fight against Thalassemia. We encourage you to send this event to your Facebook friends. Also, we invite you to check out the photos on the Wall of this event. Checks should be made payable to The Alexia and Kailyn DeBoe Family Fund. If you have any questions please do not hesitate to contact me at CKCBuohl@aol.com. We realize there are many worthwhile causes so please do not feel obligated in any way. What we will ask is that you keep Alexia and Kailyn and their family in your thoughts and prayers. If you would like more information about the twins, please read this story. The Town of Bridgewater and Bridgewater State College cordially invite you to attend the first in a series of visioning and planning sessions dedicated to rebuilding our community. 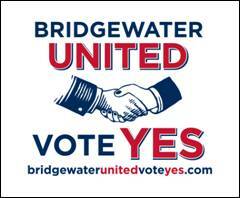 If you are interested in a Vote Yes sign for the upcoming override vote, please email bridgewaterunitedvoteyes@comcast.net. The Bridgewater Public Library has a new trustee. Eric Gibson replaces Frances Jefferies on the Library's Board. Eric is a graduate of Bridgewater State College and has a Masters Degree from Lesley University. He has taught school in Bridgewater for 17 years and is currently teaching 4th grade at the Williams Intermediate School. When asked about his reasons for running for library trustee, Eric responded, "I decided to run for library trustee because I see our local library as a vital part of a thriving community. A library provides immeasurable opportunities and resources for its citizen. My children were fortunate enough to have been able to experience the Bridgewater Public Library when it offered many educational opportunities and experiences for young children." Eric goes went on to discuss the challenges ahead. "My family has found great pleasure in the library and it saddens me deeply to see the drastic cuts to this institution. I hold firmly to the belief that despite these difficult budgetary times our community will rally around the library and a bright future is on the horizon. I am excited to have been given the opportunity to be a part of the library's future." The Bridgewater 4th of July Committee will be hosting a fundraiser featuring renowned medium Maureen Hancock. Light appetizers will be served and there will be raffles in addition to the wonderful show put on by Maureen Hancock. For tickets, please contact Lisa Buzzell-Curley at buzzcurl@comcast.net or 774.259.9173. Join the Bridgewater Community Lions at their Recycle-Rama tomorrow! Drop of your electronics and appliances to be recycled and help support the Bridgewater Community Lions. Different items will have different prices associated with the drop-off. For more information, email Beth Young at youngster123@comcast.net. Click on the link below to take a brief quiz and enter Bridgewater's zip code (02324) and perhaps we might win money needed to support the 4th of July Fireworks in Bridgewater. Pass this along to all your contacts, as well. As a Bridgewater resident, Bridgewater State College invites to to an information session relative to the work that has begun on the Swenson Athletic Field at Bridgewater State College. Please join Vice President Mike Gomes from Facilities Management and Planning, Vice President Ed Minnock from External Affairs and Susan McCombe, Director of College and Community Partnerships to learn more about the construction at Swenson Field. The library's doors close 10 minutes early for security reasons. Bridgewater Art & Custom Framing will be sponsoring an art walk this Saturday in downtown Bridgewater. Over 15 local artists will be showcasing their art on the sidewalks of downtown right in the Central Square District. The art walk will take place from 9AM to noon. 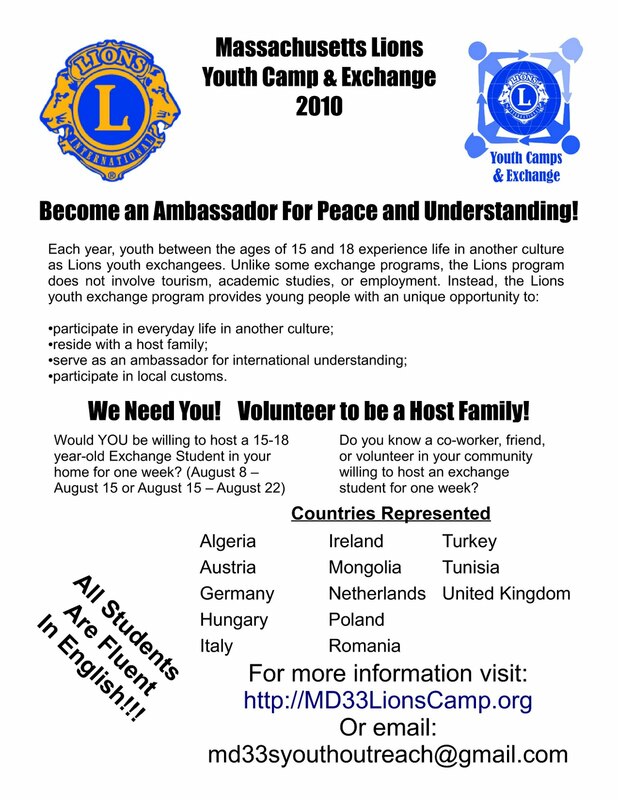 The Bridgewater Community Lions are organizing an international student exchange. Please click on the photo above for more information. The Annual Town Meeting and a Special Town Meeting will take place on Monday, May 3rd beginning at 7:00 PM in the gymnasium at Bridgewater-Raynham Regional High School. Below are links to the warrants. The Bridgewater Girls Softball Opening Day is later this afternoon at the brand new softball fields on Crescent Street. The opening celebration is open to the public and will take place around 3:30 PM at the softball fields. Please feel free to come out and enjoy this beautiful day and join the girls softball league as they showcase their new facilities.